Broadway street in downtown Philipsburg is a charming Christmas scene in December 2017. 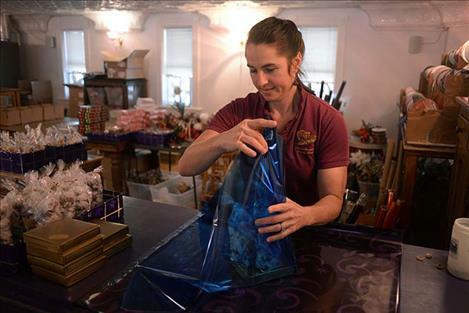 Heidi Beck-Heser wraps an assortment of candy at The Sweet Palace in Philipsburg. Beck-Heser helped her mother Shirley Beck start the business in 1997 and now manages the store. Philipsburg Brewing Company employs 15 people. 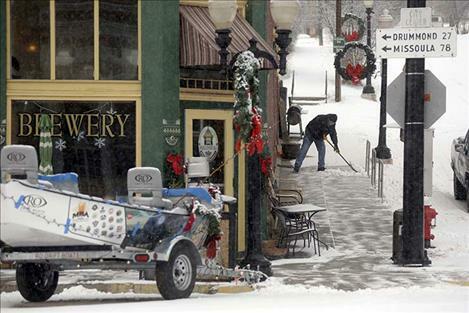 PHILIPSBURG — As the holiday season got its start on a clear morning in late November, Phillipsburg’s Main Street looked like something out of a Hallmark movie. A window washer cleaned downtown storefronts along blocks of historic brick buildings — a candy store, a microbrewery, coffee shops, restaurants, antique stores. Wreaths were hanging off ornate light posts. The surrounding hills were scattered with snow. Banners hung from windows and balconies celebrated the high school football team, the Titans, which won a state eight-man class championship the previous weekend. This was a much different scene a quarter century ago. By the early '90s, the mining, timber and agriculture jobs the town was built on in the 1860s had faded, leaving businesses shuttered, many properties owned by the bank. The motto of the one-time silver boomtown — “Founded on hope” — seemed tarnished. These days, though, Philipsburg’s historic district is one of the state’s small-town success stories — its buildings restored and bustling, with brightly painted facades that have won national recognition in places like Sunset Magazine. If there’s anywhere in rural Montana that’s managed to make the shift from the mines-and-mills industry of the past to the scenery economy of the New West, it’s here. About a third of the jobs in Philipsburg’s Granite County are now in industries driven by travel spending, according to federal statistics collected by Headwaters Economics. That fraction is up by half since 2000, and twice the national average. 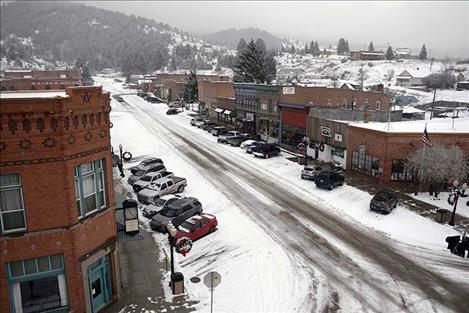 Even so, locals say, as much of a boon as tourism has been for Philipsburg, it hasn’t proven a fix for all of its small-town challenges, among them limited job opportunity, scarce housing and a graying populace. The town’s population, now 920, has begun to reverse a decades-long decline since 2010, according to census estimates. But enrollment in the K-12 Philipsburg School District is still slipping, down by 36 students to 151 pupils over the past four years. That championship football team, it turns out, is a co-op with a longtime rival, Drummond, 30 miles down the highway. Back in 2013, the two Class C schools chose to join forces instead of retreating down a league to field six-man teams. “We are stabilized, but we’re still in trouble,” said Heidi Beck-Heser with the Philipsburg Chamber of Commerce. Listening to Philipsburg’s oldtimers discuss the town’s Main Street renewal, you get the sense it wasn’t exactly planned in advance. It wasn’t as much the fruit of government initiative, they say with a touch of pride, so much as entrepreneurial ambition, some good luck and decades of hard work. As the town’s downtown struggled in the late '80s and early '90s, most of the district’s buildings were purchased by a wave of new owners, many of them newer arrivals, recalled Jim Jenner, who’s now lived in Philipsburg full-time for 15 years. Back in 1989, Jenner said, he was a businessman from Washington, out in Montana to fly fish. But then one day that summer, he got a good look at Philipsburg in the sunshine. He’d seen community rebirths play out on the west coast, he said, and figured downtown prices couldn’t go any lower, so he decided to buy the building that’s now the Broadway Hotel. “It was obvious that this place could become something of an off-the-beaten-path destination,” he said. Shirley Beck, who opened the pioneering Sweet Palace candy shop with a partner in 1997, recalled how business owners formed an “enlightenment” committee to spruce up Main Street one decorative street light at a time. They also banded together to give downtown buildings their now-iconic paint jobs, often working before they opened up shop in the mornings and after they closed at night. And they invested in savvy marketing, too — both as individual businesses and by pooling money to promote the town as a destination. Spearheaded by Beck and her business partner, Dale Siegford, Jenner said the town’s businesses took out regional print and television ads and distributed an annual chamber of commerce publication touting Philipsburg’s charms all over the west. “We have spent millions on advertising, and that’s not a joke,” Beck said. And the kicker, as Jenner points out — the small-town charm Philipsburg is selling is very much the real deal. Even so, success didn’t didn’t happen overnight — the streetlight project alone took a decade to finish, according to Beck. But eventually, helped by the marketing push, the trickle of visitors turned to a steady flow, encouraging more business owners to take the leap into investments of their own. Jenner and his then-wife opened the renovated Broadway Hotel in 2003. 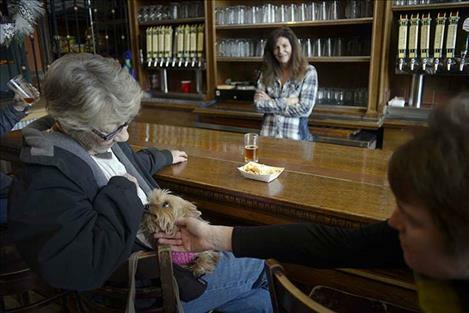 In 2012, Rob Jarvis and Cathy Smith opened Philipsburg Brewing Company in a building Jarvis had owned for 20 years. As its revitalization gathered steam, Philipsburg has earned reported media coverage as well, providing another boost to its marketing. 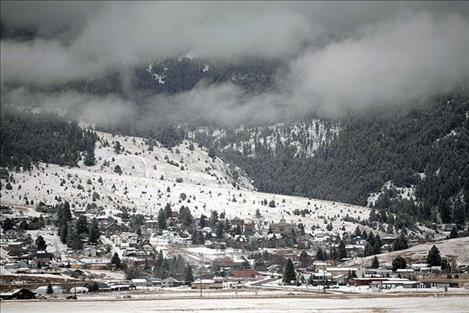 While its pre-1990 media attention was pretty much limited to poet Richard Hugo’s gloomy “Degrees of Grey in Philipsburg,” national outlets like Sunset Magazine and the Today Show have seized on the charm of its rebirth story. These days, the collection of downtown businesses in Philipsburg has reached a critical mass, proprietors say, with visitors drawn to town for the candy store or brewery or the Discovery Ski Area finding their way into other shops and restaurants. And it has paid off in economic terms — in 2016, for example, Granite County businesses collected $3.8 million in lodging revenue subject to the state bed tax. That’s about $1,140 per resident and, adjusted for inflation, a 15-fold increase over 1990. Even so, the school enrollment question hangs over Philipsburg’s future. Residents like Beck-Heser worry that losing the school and its teaching jobs could push the local hospital over the brink as well. According to census data, at least, it looks like the picture-perfect Main Street may be doing a better job of attracting retirees than families with school-aged children. In 2016, 57 percent of Philipsburg’s population was 50 or older, up 10 percentage points from 2000. Over the same time period, the fraction of the population younger than 20 fell from 26 to 16 percent. A number of Montana communities have closed schools or looked at merging with another district in recent years, particularly in shrinking agricultural communities in Central and Eastern Montana. For example, school boards in Hobson and Moore, with 102 and 95 students respectively, said last year they were looking at consolidation, according to a report by the Great Falls Tribune. The two districts already operate a three-way sports co-op with Judith Gap. A planning effort by the Philipsburg-area Rotary chapter identified attracting young families as a top priority, said Jenner, who said he thinks having more housing options and more accessible childcare would make things easier for people looking to settle down. Living in Philipsburg does have its advantages, civic boosters point out, among them a school district that thanks to its light enrollment boasts an 8:1 student-teacher ratio. The town also has cheap housing by big city standards, with two-bedroom homes listed for sale for as little as $150,000. 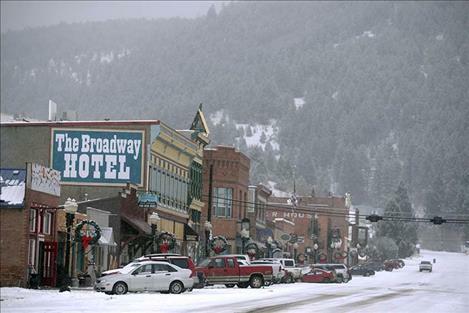 Some residents do worry about the condition of what’s available, though, and say they’re concerned about Airbnb-style vacation rentals eating into the housing supply like they have in Crested Butte, Colorado. While rural Montana’s scarce supply of jobs has historically discouraged new arrivals who aren’t able to live off retirement income, several residents said they think that might be changing as telecommuting becomes easier and as the nearby Rock Creek guest ranch, where rooms run upwards of $1,000 a night, grows into a major, if seasonal, employer. Additionally, small-scale manufacturing like the brewery, which now has 15 employees and distributes as far as Billings, might provide another path to jobs that support family-aged residents. Maddy Mason, for one, is upbeat on the town’s future. Originally from Minnesota, she moved to the area five years back for a seasonal job at Rock Creek, then never left. She started off bartending at the brewery, and now works full-time in a sales role, Mason said. She met her now-husband in the area, and enjoys Philipsburg’s affordable cost of living. “Younger people are moving here for seasonal work and making roots here,” she said. “There is no silver bullet — bottom line,” said Beck-Heser with the chamber of commerce. “It is a long slow train to turn around,” she said.